Impact crusher is widely used in crushing many kinds of large, medium, small materials whose side length is shorter than 500mm, and whose compression resistance should not be larger than 350Mpa. 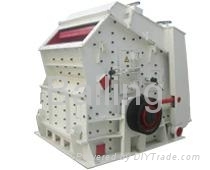 The impact crusher is widely used in hydroelectricity, highway, artificial stone and sand, building material, etc. Special structure, connected without key, high chrome hammer, unique impact liner, dealing with hard material, high efficiency and saving energy, cubic shape of product, adjustable output size.